By 2030 solar energy will have the capacity to meet all of our energy needs. The production of food and clean water will also be revolutionized. 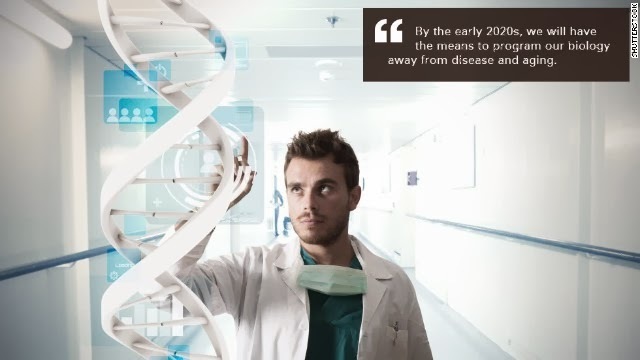 (CNN) -- By the early 2020s, we will have the means to program our biology away from disease and aging. Up until recently, health and medicine was basically a hit or miss affair. We would discover interventions such as drugs that had benefits, but also many side effects. Until recently, we did not have the means to actually design interventions on computers. All of that has now changed, and will dramatically change clinical practice by the early 2020s. We now have the information code of the genome and are making exponential gains in modeling and simulating the information processes they give rise to.